Sadly, I have no new personal photos to share this week as I have been neglecting my camera. But then this popped up on my Facebook feed and it made me giggle, so I knew I had to share it. You are totally doing it too, aren't you? 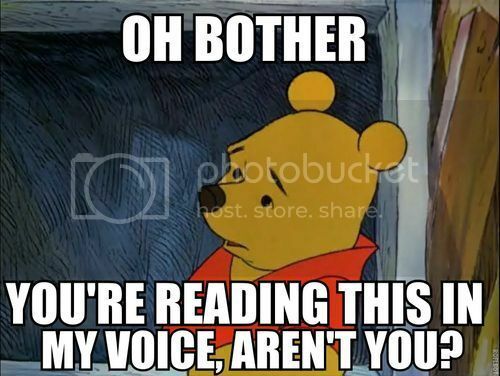 LOL I totally was using his voice in my head to read that. Funny how that works. I totally did read it in his voice. I admit I had no new pics this week either LOL! I love me some Winnie the Pooh! Of course! I was going to say I love me some Pooh but Carolyn beat me to it! :) I <3 Pooh! Ha ha, that's funny. I totally was! I think that it's impossible to not read that in Winnie's voice, lol. I've seen that - so cute! !